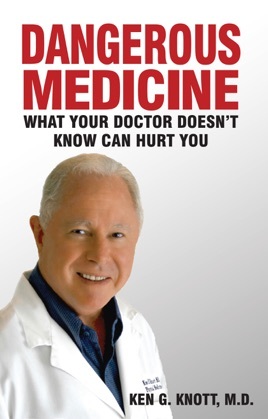 "Dangerous Medicine: What Your Doctor Doesn't Know Can Hurt You" is a book that was written to inform the reader about many common misconceptions and questionable care associated with the practice of medicine. incorrect training. It's more logical to treat the causes of conditions or diseases rather than the symptoms, but that is not what most doctors do. Dr. Knott offers readers information that will allow them to become a more proactive and integral part of optimizing their own health. His intent is to provide science-based information that will assist the reader in making the best and most healthy choices. Why leave your health and life to chance? Why treat symptoms without addressing why the symptoms appeared in the first place? The purpose of this book is to provide an understanding of what is really necessary. As we age, our hormones decline. However, the reverse may actually be more accurate in that we age because our hormones decline. Dr. Knott addresses the issue of declining hormones in both men and women by providing detailed information about bio-identical hormone replacement. Additionally, questions about nutrition, supplements, exercise, hyperbaric oxygen, and treatment for nagging injuries will also be answered. It is a must read for anyone over the age of forty that wishes to optimize their health while possibly adding years to their life. I am truly amazed by how a 248 page book (that took one day to finish) could have such a profound impact on my life. This is an absolute must-read for people of all ages. I have since bought about 10 copies for my friends and family (and myself when it kept getting stolen)! I live in Atlanta, so I went straight to Dr. Knott after reading the book and at 22 years old, was finally diagnosed with severe hypothyroidism. This book is easy to read and offers just the right amount of scientific explanation. He definitely doesn’t dumb anything down. Dr. Knott’s tone is informative, but by no means arrogant or demeaning. You definitely get the sense that he is simply trying to help people and inform his readers of a drastically different side of modern medicine. I could literally go on FOREVER but all I can say is thank God for Dr. Knott and this book! Buy the book!